The purpose for Route 125 is to allow you to get to Shoal Cave. 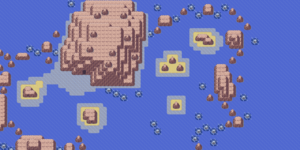 However, there are some trainer fights here as well, explore the seas to the northeast to find everyone. In Emerald you can also get a Big Pearl on the second island on the eastern side. This page was last edited on 25 November 2018, at 20:30. This page has been accessed 72,391 times.